Who uses the HRRR archive? What is this HRRR archive? This HRRR archive is a collection of output from NCEP's High Resolution Rapid Refresh model. This is a model developed by NOAA ESRL and is run operationally every hour at NCEP's Environmental Modeling Center. It continues to be developed by ESRL. The operational HRRR generates hourly forecasts gridded at 3 km for 18 hours over the contiguous United States making it the highest spatial and temporal resolution forecast system run by NCEP. HRRR analyses and forecasts are exceptionally valuable to the research community. However, an official HRRR archive does not exist. We began archiving HRRR data in April 2015 to support research efforts at the University of Utah. The archive system failed and we lost all the data. We rebuilt the archive with data beginning 15 July 2016. Instead of storing all available HRRR files, we only download the files most useful to accomplish our research efforts. We realize this data is valuable to many others and have made the archive publicly accessible for research purposes. We currently have 60 terabytes of storage space at our disposal. What files are contained in the HRRR archive? Note: Not all hours are available for the experimental runs. Became operational after July 12, 2018. Note: Some days and hours in our archive may not be available. Either the forecast wasn't run that hour (typical for the experimental models), or our download scripts failed to download everything. GRIB2, or Gridded Binary Version 2, is a standard file format used by meteorologists for model data sets. There are several useful tools for working with the data. wgrib2: a command line utility used to read GRIB2 files. pygrib: a Python module used to read GRIB2 files. IDV: a desktop application that can view many types of weather data. NOAA Toolkit: graphical software that can read and visualize GRIB2 files. I highly recommend this tool if you haven't used GRIB2 files before. Where do the HRRR output files come from? The operational HRRR (hrrr) and HRRR Alaska (hrrrak) is downloaded via HTTP from the NOMADS server. Experimental HRRR (hrrrX) is downloaded via FTP from NOAA ESRL (credentials required). What version of HRRR is in this archive? HRRRv1 was the operational model prior to August 23, 2016. HRRRv3 was be implemented at NCEP on July 12, 2018 beginning with the 12z run (source). Version 3 extends the forecast period for the 00, 06, 12, and 18 run out to 36 hours, but we have decided not to archive the f19-f36 files. Improvements in version 3 include updated Thompson microphysics, improved MYNN PBL scheme, updated land surface model with 15 second MODIS data, refined roughness lengths for certain land use types, and additional improvements in assimilation methods including lightning, radar radial velocity, and TAMDAR. HRRRv4 is under development at ESRL with expected implementation in 2020. This version will make more use of ensemble modeling methods and many improvments to model phyysics. When do we download the HRRR data? HRRR, HRRR-X, and HRRR-Alaska is downloaded from NOMADS and ESRL four times a day at 00:30, 03:30, 06:30, 09:30, 12:30, 15:30, 18:30, and 21:30 UTC. We only download HRRR data eight times a day to prevent anyone from grabbing real-time forecasts because this HRRR archive is not meant to be used for real-time or operational products. If you are looking for today's HRRR output, then download directly from NOMADS. This project is turning into a classic case of one of my favorite children's books If You Give A Mouse A Cookie where starting one thing has grown and continues to grow into something bigger. At the 2017 Annual AMS meeting I talked with a guy on the the AMS Board on Data Stewardship. He said the lack of a HRRR archive was one concern brought up at their board meeting. Archiving high resolution model data is an expensive task. This is a growing issue in the atmospheric science community as we move to higher resolution models that generate terabytes of data annually. At the 2018 Annual AMS meeting, it sounds like NOAA is interested in pushing the HRRR output to its Big Data partners. There are many opportunities with cloud computing where we "bring the data to the computing." An archive on the cloud can be kept in one place and researchers can use cloud resources to process the data, perform analyses, and initialize WRF simulations without downloading the model output on their own computers. The benefits and complications of cloud computing were discussed at the 2017 Modeling Research in the Cloud Workshop. It would especially be beneficial if it were possible to efficiently mine the large dataset for a specific variable at a point or subgrid for a range of dates or times. Perhaps this model data needs to be stored in HDF5 format rather than grib2. It would be nice if there was fewer redundant data fields between the files. For instance, some fields are available in the prs and sfc and nat files. Until data storage challenges are overcome, I would like to make this HRRR archive easily available to everyone to demonstrate the interest and need for having such an archive. This archive has already proven beneficial to many researchers and has served in many applications. In the future, it is possible to have server-side data processing that generate time series or wind roses for point locations in the HRRR model. My current methods for doing this are extremely inefficient because they still require downloading a temporary file for a single variable of the entire grid (which contains about 1.9 grid points over the contiguous United States). If I were in charge of the HRRR, I would like to see a more rapid data assimilation cycle and run the model every 15 minutes out to a 48 hour forecast. This would ultimately create 7 times as much data while providing a 96 members for time-lagged ensembles. Maybe different physics parameters could be used in each 15 minute model run to produce more model spread. My dream for a future weather prediction system is a model that is continuously updating rather than rapidly updating. The main concept of this archive is to create a HRRR archive in one place that is easily accessible so researchers don't have to redundantly store local archives, with the purpose to provide the data you need, when you need it. Who archives the HRRR data? 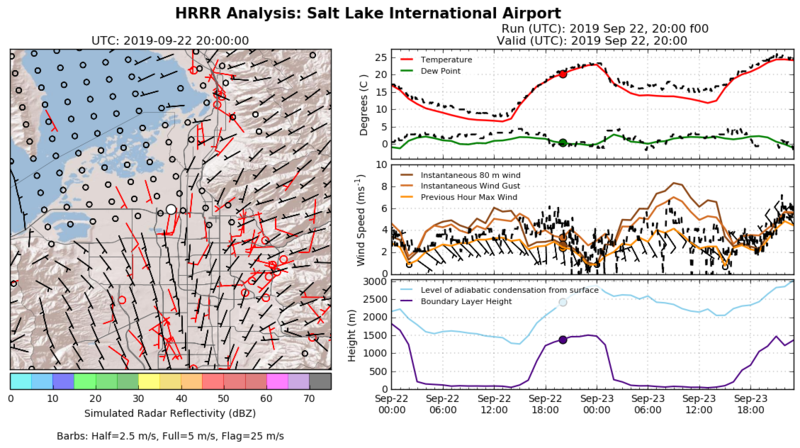 The HRRR archive at the University of Utah is managed by Brian Blaylock and the MesoWest group on resources at Utah's Center for High Performance Computing. It can also be found in the University of Utah Hive. Please contact Brian with questions regarding the archive. Why do we archive the HRRR? While you can find current HRRR output at NOMADS, there is no official HRRR archive that is publicly and easily available, to our knowledge. This "gap" in the NOAA data archives will hopefully be filled in the future, seeing that their vision is that all NOAA environmental data shall be Discoverable, Accessible, Useable, and Preserved. We hope to be part of the solution to that goal. Initialize the Weather Research and Forecast (WRF) model with HRRR analyses as initial and boundary conditions. More info here. Model verification, where HRRR analyses and forecasts are compared to observed conditions. Retrospective analysis of high-impact weather events. Basic statistics of variables (max, min, mean, percentiles). Potential work with machine learning applications. 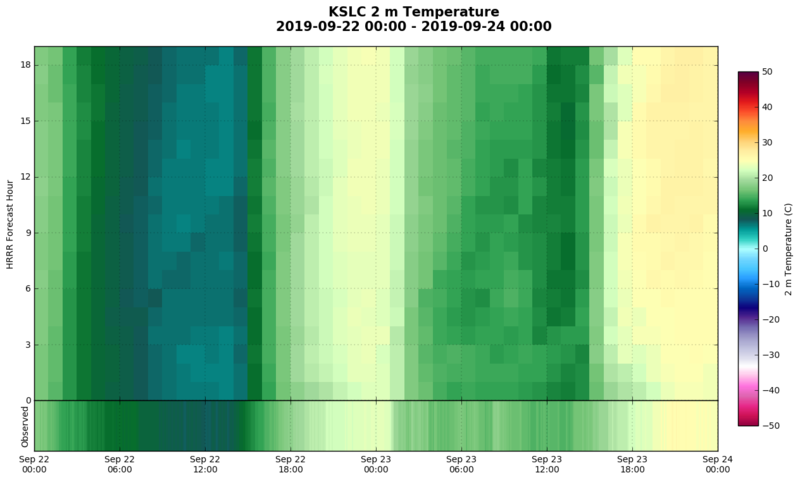 This archive allows us to perform analysis of the HRRR model performance, independent of the ESRL folks, for our own research purposes and goals. Archive methods are becoming more important with increasing requirements by funding agencies to maintain archives of the data used in research grants. The University of Utah is setting up a framework for handling such requirements through what they call The Hive. This HRRR archive was used as a test case for how that framework can be used for very large data sets. We hope this archive will increase the volume of research and model validation using the HRRR model that otherwise could not be done. In the future, the HRRR may be archived as part of NOAA's Big Data Project. This will lead to additional uses of model forecasts and analyses in cloud computing environments and research done with rapidly updating forecast systems. You are welcome to use the archive for your own research, but as a courtesy, please register and read the "Best Practices" document before downloading from the archive. Where else can I find archived HRRR data? Where is the HRRR archive? The archive is physically located at the University of Utah Downtown Data Center in Salt Lake City, Utah. It is hosted on Utah's Center for High Performance Computing Pando archive storage system. After registering, you will be redirected to the interactive download page. Click the "Scripting Tips" button for how-to instructions to download from Pando with wget or cURL. These tips also show how you can target specific variables you are interested without downloading the entire file. This will save you space an download time. What is the Pando archive? Pando is a colony of quaking aspen trees in southern Utah, thought to be the oldest and largest living organism in the world, linked together by the same root system. According to Wikipedia, Pando is Latin for "I spread". The name is fitting for the CHPC object storage system because of its resilience and scalability, like the tree system. The underlying software running Pando is Ceph, a project supported by RedHat. While Ceph can be configured in a few ways, in this archive Ceph manages the data objects with the Amazon S3 API. It is a separate "island" from the rest of CHPC file system so that output from other programs cannot write directly to it. Instead, files are copied to Pando through utilities like rclone or s3cmd. Pando is built in three parts. All of these can be scaled to meet needs of the growing archive. 9 OSD Servers (16 8TB drives, each) - These contain the data objects. 3 Monitors - Monitors keep a map of the data objects. When a request for data is made, these monitors are contacted for the object map and return the object's ID. 1 RADOS Gateway node - You, as the client, make requests through this gateway for data downloads. What days are available to download? The HRRR archive begins on 15 July 2016. Browse the interactive web download page for a visual sense of what data files are available each day. We store all the operational analyses and forecast for the surface fields. Unfortunately, we decided the pressure field files (~315 MB) are too large for us to save the forecast hours. We store analyses of the experimental HRRR and HRRR Alaska models. 2015-04-18: The HRRR archive is born! Only HRRR analysis hours (f00) were stored for sfc and prs files. 2016-07-27: Began storing HRRR 15 hour sfc forecasts. 2016-08-24: Began storing HRRR 18 hour sfc forecasts (HRRRv2 became operational). 2016-12-01: Began storing experimental HRRR-Alaska. prs analyses and select sfc variables for analyses and forecasts. 2016-12-01: Began storing available experimental HRRR surface analyses. 2017-03-01: Moved HRRR archive from local file system to Pando storage. 2017-06-08: Began storing all available HRRR-Alaska sfc variables. 2017-12-27: Pando Failed All prior data was lost. 2017-02-26: Backfilled to 2016-07-15 HRRRv2 data from The Climate Corporation. 2018-07-12: HRRRv3 Upgrade and HRRR-Alaska becomes operational. Many people are interested in the HRRR archive, including yourself (obviously, or else you wouldn't have Googled HRRR archive). The initial purpose of this HRRR archive was to serve atmospheric science research at the University of Utah, particularly my own research for my Master and PhD degrees. For example, I used HRRR analyses to initialize WRF simulations. The archive is searched for quite often by people like you. Since this archive has been published online I have received inquiries and download requests from National Weather Service employees, NASA scientists, researchers at the National Institute of Standards and Technology, a United State Air Force Captain, employees at NVIDIA, Lockheed Martin, commercial wind power companies, university professors, graduate students, airline forecasters, post docs, the USDA Agriculture Research Services, dozens of students working on capstone project, and many others. The HRRR archive allows researchers to use past weather data at high temporal and spatial resolution without the need to run their own WRF simulations. This is a huge time saver. How is the HRRR archive useful to you? Send me an email and let me know. Blaylock, B.K., J.D. Horel, and C. Galli, 2018: High-Resolution Rapid Refresh Model Data Analytics Derived on the Open Science Grid to Assist Wildland Fire Weather Assessment. J. Atmos. Oceanic Technol., 0, https://doi.org/10.1175/JTECH-D-18-0073.1. McCorkle, T.A., J.D. Horel, A.A. Jacques, and T. Alcott, 2018: Evaluating the Experimental High-Resolution Rapid Refresh-Alaska Modeling System Using USArray Pressure Observations. Wea. Forecasting, 33, 933-953, https://doi.org/10.1175/WAF-D-17-0155.1. McNicholas, C. and C.F. Mass, 2018: Impacts of Assimilating Smartphone Pressure Observations on Forecast Skill during Two Case Studies in the Pacific Northwest. Wea. Forecasting, 33, 1375-1396, https://doi.org/10.1175/WAF-D-18-0085.1. Poolla, C., and A. K. Ishihara, 2018: Localized solar power prediction based on weather data from local history and global forecasts. 45th IEEE Photovoltaic Specialists Conference. Link. 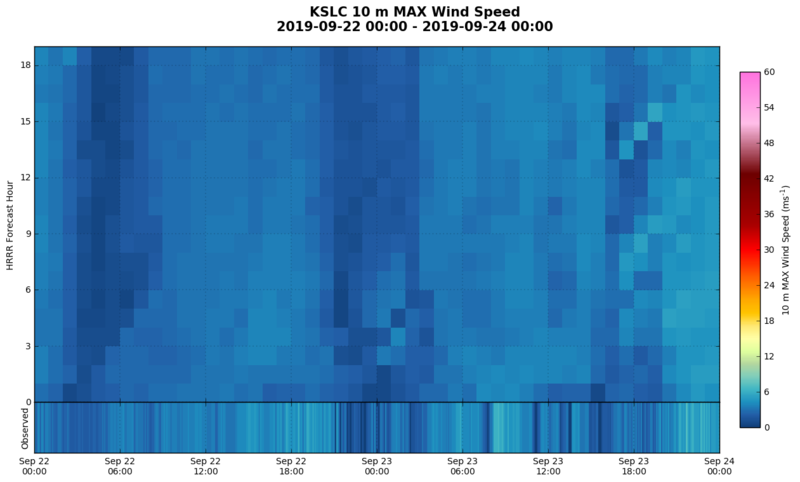 Rosenow, A.A., K. Howard, and J. Meitin, 2018: Gap-Filling Mobile Radar Observations of a Snow Squall in the San Luis Valley. Mon. Wea. Rev., 146, 2469-2481, https://doi.org/10.1175/MWR-D-17-0323.1. I'm using the Open Science Grid to calculate long term statistics, calculated for +/- 15 days for every hour of the day for all the HRRR files in our archive. I calculate the following percentiles [0,1,2,3,4,5,10,25,33,50,66,75,90,95,96,97,98,99,100]. The HRRR analyses mean winds are comparable with the results of James et al. 2017. A handy-dandy Jupyter Notebook for making various maps. Also, a notebook on overlaying GOES-16 images with HRRR data. 2-day Time Series: Time series graphs of observed values for select MesoWest stations and HRRR values for f00, f06, f12, and f18 for the last two days. Check out the HRRR Point Forecasts page, and select the clock next to a station to view verification of the HRRR model for the last two days. Investigated gravity wave in St. Louis and thunderstorms in Atlanta. Quantify inversion strength during the Utah Fine Particulate Air Quality Study, January 2017. Matt Lammers from NASA combined HRRR 925 mb winds with GMI and IMERG precipitation data for visualization of Hurricanes. Do you work/study at the University of Utah, too? Cool! Go Utes!! Here are a few helpful tips that will make your life easier. That is, if your life involves using HRRR data from our handy archive. Please share with me cool stuff you learn! I have stuff in my own Pando buckets. How can I view those files in a browser? The HRRR download page is a custom-built interface for accessing files in the HRRR buckets, but what if you have your own buckets in Pando? You're in luck, because I created this more generic web interface for viewing and downloading file objects in your Pando buckets that look more like the Apache file explorer. How full is our Pando allocation? Is the archive on the local file system? Yes, we keep a backup of the HRRR archive on horel-group7. Want a behind-the-scenes tour of the HRRR archive? How do I get the HRRR data if what I'm looking for is compressed? Copy the models.tar.gz file to your own space. Yes, this is large (~20 GB). It contains all the model data we archive (I warned you that this was inefficient). You can untar the entire file, but that would take a looonng time, and you don't need everything in that file anyways.